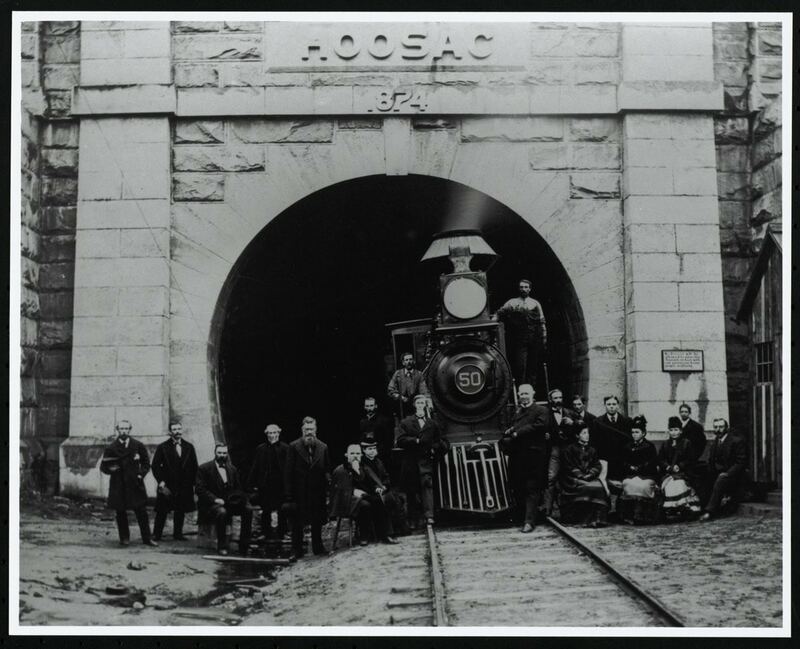 The opening of the 4.75 mile Hoosac Tunnel in 1874 in North Adams, a monumental and much publicized engineering feat in its time (Oliver Wendell Holmes facetiously called it 'the big bore'). The tunnel is the longest rail tunnel east of the Mississippi River. 100 years of Berkshires’ railroading: What will the next century bring? 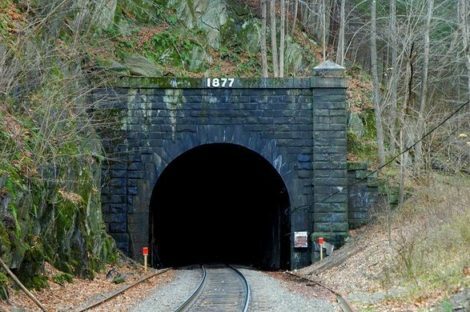 The eastern portal of the Hoosac Tunnel as it appears today. In 1919, the New York, New Haven & Hartford Railroad is operating frequent passenger and freight service between New York City; Norwalk, Danbury, and Canaan, Conn., and Great Barrington, Stockbridge, Lee, Lenox, and Pittsfield, Mass. Its State Line (West Stockbridge) operation serves industrial customers and passengers between Van Deusenville, Mass., and State Line MA/NY, where it interchanges traffic with the Boston & Albany RR. 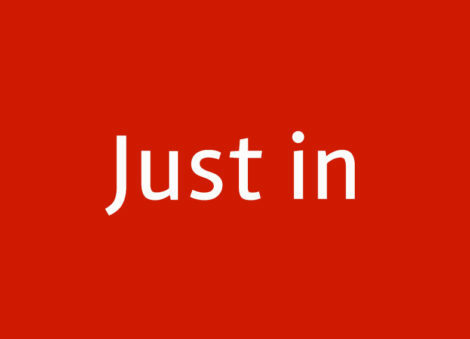 By 2019, the State Line operation has been abandoned, and the main line track is owned by the states it serves, Connecticut and Massachusetts. The Housatonic Railroad operates one freight train, only, five days a week between Danbury and Pittsfield — and back. 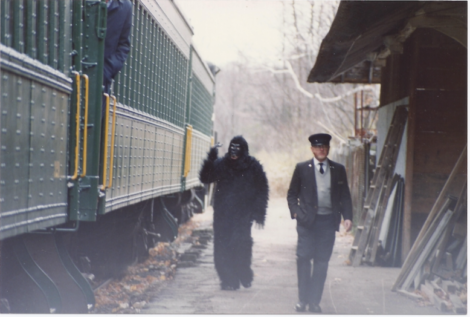 The author (at right, with another crew member following) at the Berkshire Scenic Railway station in Lenox Dale. In 1919, the Pittsfield & North Adams Railroad line is busy serving passengers and quarries and dozens of other industries between Pittsfield, Cheshire, Adams, and North Adams. Today, only the northern five miles, owned by the Commonwealth of Massachusetts and operated for freight by the Pan Am Southern Railroad between Adams and North Adams, are available for serving industries. The lower portion from Adams to Pittsfield has been abandoned and is the Ashuwillticook Rail Trail. Beginning in the fall, 2015, the Berkshire Scenic Railway’s Hoosac Valley Service began operating tourist trains on the northern four miles, which was expanded to five miles in 2018. In 1919, the Rutland Railroad is operating passenger and freight trains on its “Corkscrew Division” between Chatham and New Lebanon, N.Y.; Bennington and Rutland, Vermont, and northern Vermont towns and cities. The Corkscrew Division was abandoned in the 1950s. A portion through New Lebanon is now the New Lebanon Speedway. In 1919, the 7-mile Chester & Becket Railroad is providing freight services for granite quarries in Chester and Becket, Mass. It interchanges with its owner, the east-west Boston & Albany Railroad in Chester. 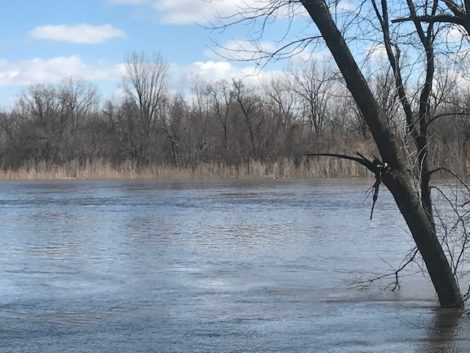 Today, the Chester & Becket has been abandoned, and the line and one abandoned quarry are open as a hiking trail and park by the Becket Land Trust. A Berkshire Street Railway trolley on Main Street in Great Barrington. 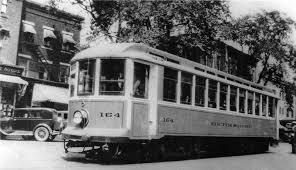 In 1919, trolley cars are in operation from Hoosick Falls, N.Y., to Bennington, Vt., and Williamstown, North Adams, Pittsfield, Stockbridge, and Great Barrington, Mass., and Canaan, Conn. A myriad of individual lines have been combined into the Berkshire Street Railway under the ownership of the New York, New Haven & Hartford Railroad. The public uses the trolley lines for commuting to work and school, for shopping, for visiting friends, and for touring. The trolley company has started building the “Huckleberry Line” between East Lee and Huntington, Mass. The Huckleberry Line was abandoned within two years. By 1932, the trolleys were all gone, and buses had replaced them. No thanks to the introduction of the Interstate Highway system, railroad traffic through the Berkshires has decreased significantly in the last hundred years. School children now take buses or are driven in private cars; and no thanks to the decrease in local industry, commuters now take their cars to work instead of trolleys and railroads. In 1915, the Town of Lenox had three railroad stations and the Town of Adams had five for the convenience of the large work forces in each town. Today’s freight trains are longer and heavier with larger cars than their predecessors, thus requiring fewer trains each day. And, although the closing of coal-fired generating plants in Bow, N.H., and Hadley, Mass., has pleased environmentalists, it also has eliminated the many coal trains that passed through the Berkshires each week. What will railroading in the Berkshires be like by 2119? Fine article by Jack Trowill on the history of railed transportation in the Berkshires. The reduction and almost demise of passenger traffic is due to the automobile; it is so convenient. It is also so polluting, not only in vehicle emissions, but also in the gigantic petroleum industry with its omnipresent extractions. Too bad we’re not clever enough to figure out how to move people en mass, as so many other countries do.